The Taskforce team remembers 2017: highlights, visits, and achievements; and starts to look forward to 2018. It is just one year since Libraries Deliver: Ambition was published, but it feels like so much has happened. The 5 of us visited a total of 69 libraries during the year [see below for the full list!]. This is a combination of formal trips and those which we visited in our own time. Also several were visited a number of times! We saw lots of evidence of investment - refurbished buildings, new projects taking off, and libraries crowded with readers. We also met many staff - and heard from them about their challenges and ideas. This map shows all formal visits to libraries since the Taskforce started work - it includes workshops, Taskforce full meetings, as well as visits by individuals. 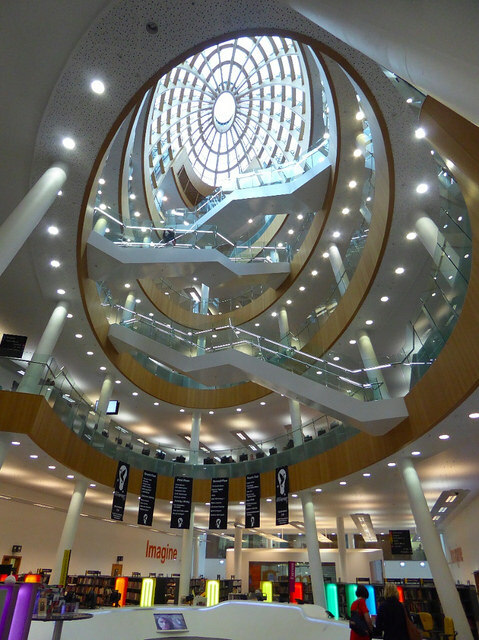 Highlights included The Word, the multi award winning new library in South Shields. Julia wrote up her visit there for CILIP’s PMLG Access magazine. Different team members went to Liverpool Central on separate occasions: one was to attend the Makefest in July - a fascinating event, with enthusiastic makers sharing their skills and expertise on all 4 floors of the library (spilling out onto the roof terrace and filling the children’s library); and the second time to attend the ‘Voyage of the Data Treader’ - whilst also calling in to see the Liverpool version of the Harry Potter exhibition, produced as part of the Living Knowledge Network partnership with the British Library and 20 other libraries across England. 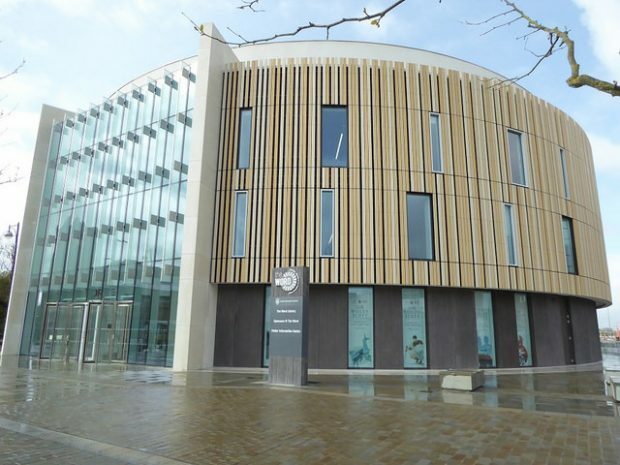 Julia attended the opening of the new library in Halifax, which is next to the restored Piece Hall and at the heart of the evolving cultural quarter. An intriguing development that blends a modern library building with the remains of a former church: stone tracery on one wall, a glass box media centre on another. 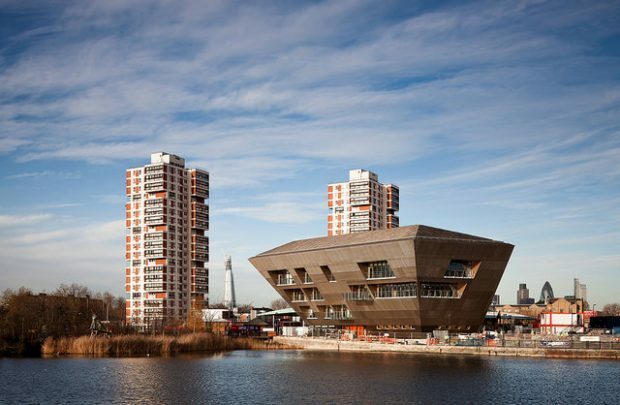 We hosted several events in Canada Water library - a dramatic geometric building overlooking the re-filled basin in a regenerated area of Southwark. An excellent workshop venue, and a good opportunity for participants to take a look around this busy library. Several of us also visited Storyhouse - several times. An impressive arts centre, with cinema, theatre and library all located seamlessly in a renovated 1930s art deco cinema in the centre of Chester. Our blog post following the Taskforce meeting shares more details and photos. We were privileged to attend the opening events of many new and refurbished libraries. Besides Halifax (mentioned above), Kathy attended the official opening of Storyhouse. We went to the re-openings of 2 of Hampshire’s refurbished libraries: Fleet and Fareham, the opening of the new Berkhamsted library in Hertfordshire, and attended the official reopening of Edmonton Green library in Enfield. We visited the brand new library in Meopham, Kent, and held a workshop in the refurbished library in Beeston, Nottinghamshire. And, of course, we can’t forget the celebrations in Winchester Discovery Centre, as they marked 10 years since that library was refurbished and reopened. Others that we’ve heard about but haven’t had chance to visit yet include: a programme of refurbishment in Kingston, a new library in Islington: Cat and Mouse, the refurbishment of Oxford central library, improvements made to the historic listed central library building in Stratford upon Avon, a new library in Woodseats, Sheffield and many more. We’re looking forward to seeing some of these in 2018. Libraries Week took place between 9-14 October and was a huge credit to CILIP who expanded the previous day of activity into a full week. It saw a concentrated period of activity from Taskforce team members. They visited 17 libraries - including Pimlico, Stockton, Chislehurst, Wimbledon, Chatham and John Harvard. We published a round up post which collated many of the events which took place in libraries during the week, and included the visits other members of the Taskforce made. Kathy accompanied the Libraries Minister on his visit to Pimlico library, after which he shared his reflections on his visits to libraries since his appointment in a blog post. Another Festival which took place during Libraries Week was the London Libraries Worlds of Possibilities event. Lots of activities took place over 4 days, in most of the 325 libraries across London. Kathy enjoyed ‘Reunion and the Dark Pony’, Sheila saw The Death of Ivan Ilyich in Wimbledon library, and Julia loved hearing Val McDermid share her passion for libraries - during a Libraries Week author talk in Chatham. We’ve been working hard over the year to promote the role that libraries can play in contributing to others’ strategies. For example, Sheila worked closely with colleagues in DCMS to get some very positive mentions about how libraries help people develop their digital skills in the UK Digital Strategy - they are described in it as the ‘go-to place provider of digital access, training and support for local communities’. In October this year, government published its Internet Safety Strategy green paper, that aims to make Britain the safest place in the world for users to be online. Libraries feature in this because of the work they do on things like through tech teach-ins aimed at parents and family learning, and participation in UK Safer Internet Day activities. Kathy has also continued to work with the Ministry of Justice (MoJ) on the expansion to their Commuter Hubs network, using under-utilised back office space in libraries. Phase 2, involving libraries in Basingstoke, Farnborough, Putney, Leyton and Witham, is now drawing to a close and the evaluation is ongoing. We’ll be saying more about the move to phase 3 shortly, but MoJ are looking to continue the operation of many of these sites - and possibly expand further afield - due to the levels of usage and very positive feedback received from their staff. We also took every opportunity to talk with people from a wide range of organisations - in particular decision makers in the public sector - about how libraries contribute to their objectives. Particular highlights were meetings of the Chief Cultural & Leisure Officers Association London meeting, the Connected Local Government Conference, Local Government Association Annual Conference and Exhibition, and the Global Library Excellence conference. Taskforce meetings were held in 5 libraries during the year: South Woodford library and gym in February, The Hive, Worcester in late March, Cambridge central in July, the new library in Canning Town in October and Chester’s Storyhouse in December. We also met in the Free Word Centre, Farringdon in May, when The Reading Agency was our host. Minutes of all our meetings are posted on our GOV.UK page. One of the achievements at the end of 2016 was the creation and launch of the LOFE fund. Funded by DCMS and administered by Arts Council England, it was heartening to discover that over 100 library services applied, putting forward a wide range of innovative ideas. 30 projects are underway, in 46 local authorities, from Barnsley to West Sussex. We noticed that there was a large number of projects that included creation of a makerspace (or similar activity) and we’ve run a couple of workshops which have brought not only people involved in those projects together, but also included others from library services around the country who were either planning or already had this sort of space, so that they could share experiences and ask questions. We have commissioned and funded an evaluation of all the projects, which will be published and disseminated in 2018.
plus a Benchmarking framework. These saw the team (in particular Sheila, who led these workstreams) working with the Optimo partnership on Alternative Delivery Models, and the LGA on data elements of the sustainable planning toolkit, and their contractor on the Benchmarking framework. We also created a new page to bring together a range of resources on makerspaces - following the workshops mentioned above. All our published material is available on GOV.UK. As a team, we have become prolific event organisers. We have held a total of 14 masterclasses and sector forums during 2017. Directly after publication of Libraries Deliver: Ambition at the end of 2016, we held a series of 4 events (in Newcastle, London, Bristol, and Birmingham) designed to give people the opportunity to look in more detail at the new strategy. This blog post listed the different workshops held, shared discussions held during the panel debates and set out our plans for masterclasses for the rest of the year. The series of masterclasses which followed covered income generation, makerspaces, creative thinking, alternative delivery models, strategic planning and the benchmarking framework. These events were attended by over 500 people, and we followed up each one with a detailed blog to share learning with those unable to attend. We’re pleased to say that the feedback on these events have been really positive - attendees confirmed how much they valued the expert speakers, practical focus, and opportunities to network and share ideas. We’ve a further 6 masterclasses due to run before the end of March 2018, with others in development for the rest of the year. Sheila worked with colleagues in the DCMS Mutuals Team to provide support for libraries exploring Alternative Delivery Models - not only did we run 3 masterclasses to give them a chance to hear from library services who’ve already done this, and produce a detailed toolkit to provide step by step advice and guidance, but 2017 also saw 7 library services benefiting from grants for the Mutuals Interim Support Fund, which paid for technical support and practical help in undertaking options appraisals. When we launched Ambition, we also announced that we would be helping the Upper Norwood Library Trust set up a Community Managed Libraries Peer Network, alongside Locality and SCL. Kathy, Sheila and Julia have been providing support to help it get established, and it’s now up and running, with a great blog, numerous training webinars, and plans for joint working with SCL and others to produce advice and guidance to help CMLs set up and run their libraries effectively. It will be running its first national conference in March in Sheffield (booking is now open, via the link). Take a look at what the network is up to if you haven’t already - and spread the word about the support available to colleagues and communities who are contemplating this sort of arrangement now or for the future. And some special thank yous…. Having lost count during 2017 of the number of ‘train miles’ travelled, phone calls made, and hours spent meeting new people across government to explore opportunities and make the case for including libraries in their strategies, we do still look forward to more of this in 2018 - really! We are hopeful of seeing libraries feature in more government strategy documents, we’ll continue to forge new partnerships, and we want to help make the good practice work we pulled together in 2017 increasingly embedded as libraries’ ‘business as usual’ in 2018. We’ll share more about our plans once we’ve finalised the action plan we started discussing at our Taskforce meeting in December. Subscribe to this blog to be kept up to date. Hampshire’s two refurbished libraries were Fleet and FAREHAM. Farnham is in Surrey. Of course! Apologies - now amended.